The capacity crunch is in full force right now, with a variety of factors contributing to it. There are three major contributing factors: the shortage of drivers, high freight demand, and new regulations. The combination of high driver turnover and the decreased interest of the younger generation in joining the workforce has led to a major driver shortage that could only get worse in the future. PLG Consulting estimates that the industry is short about 60,000 drivers and that will increase to 160,000 by 2026 if nothing changes. While the supply of available trucks is dwindling, the demand for freight is steadily increasing. 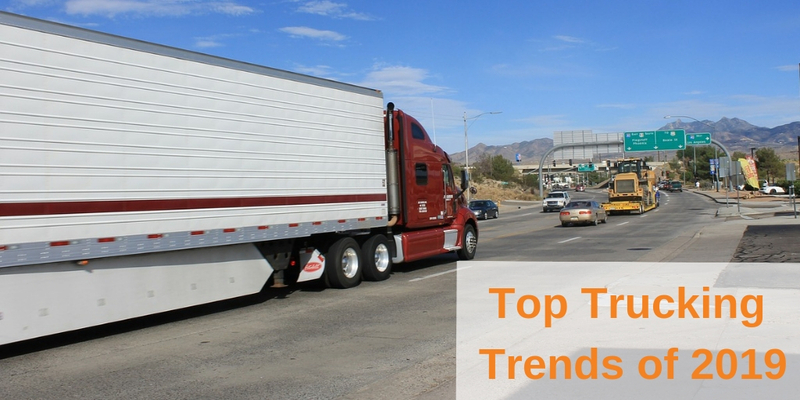 The American Trucking Association predicts freight volumes will increase by 35.6% by 2029, or an average of around 3.24% per year. The final major factor contributing to the capacity crunch is the ELD mandate. While this mandate is good for increasing safety and compliance, it tightens capacity even more. Talking Logistics estimates that the mandate’s enforcement will result in a “3-5% decrease in industry-wide productivity and up to a 16% decrease in the average miles per day a driver can cover.” Pickup and delivery windows are also affected due to the strict limit on HOS. These factors all combine to create the perfect storm of tightened capacity. Of course, with tightened capacity comes an increase in rates -- but organizations must have drivers and trucks to be able to handle the loads. See a breakdown of industry average operating costs per-mile with the Cost of Trucking Operations in the US infographic. By now, everyone knows about the ELD mandate and what the guidelines for compliance are. Automatic onboard recording devices (AOBRDs) are still grandfathered in and able to be used, but the deadline to change over to an ELD is December 16, 2019. While there was a sharp decrease in HOS violations immediately after the mandate took effect, many drivers feel that the rules are strict and put too much pressure on them. This has pushed the U.S. Department of Transportation to consider making changes to its HOS regulations for interstate commercial drivers. If the HOS rules are amended, this would greatly help drivers, as well as help lessen the impact of the increased capacity crunch. Congestion has always been a problem affecting productivity in the transportation industry, and 2019 will be no different. In the American Transportation Research Institute’s (ATRI) annual Cost of Congestion To The Trucking Industry infrastructure study, it was reported that congestion cost the trucking industry $74.5 billion and 1.2 billion hours of productivity. To put it another way, this is equivalent to 425,533 trucks sitting idle for an entire year and costing an average of $6,478 for each truck on the highway. All of this congestion is caused by just a small portion of the infrastructure in the US. In fact, just 17.2% of highway miles account for 86.7% of these congestion costs. In order to combat the sub-par infrastructure, high-quality mobile logistics solutions are necessary to plan and optimize the best route. New trucking technology is constantly being developed, and autonomous trucks seem to always be the hot button topic. With the release of the U.S. Department of Transportation’s (DOT) 80-page document titled “Preparing for the Future of Transportation: Automated Vehicles 3.0,” autonomous trucks look to be close to reality. While this is still a draft document, it lays out the framework that the DOT will use to create policies for automated vehicles and ensure the safety of everyone involved. Artificial intelligence and blockchain look to be on the rise as well, with the potential to streamline operations and give much better visibility into the supply chain. The role of cloud-based technology will play a major role in the development and hosting of this technology and others in the future. While this is not an exhaustive list of trends to watch for in 2019, we feel that these 4 trends will have the biggest impact on the industry this year. In order to stay ahead of them, be sure to have the right trucking technology in place. Want to know what that looks like? Contact us today for a demo and we’ll get you on track to streamlining your operations.